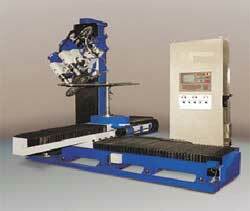 Nokta Metal Ltd offers two models of polishing (buffing) machines for aluminium profiles, depending on their moving parts, namely "moving heads" or "moving work- table". Those machines can have either one or two work-tables. 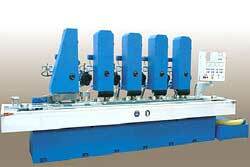 Aluminium extruded profiles to be polished are laid over a moving work- table which maximum dimensions of 1000 mm W x8000 mm L. The rotating polishing heads (one or two heads) that are mounted on to a rigid body can move along the work-table(s) on rails. 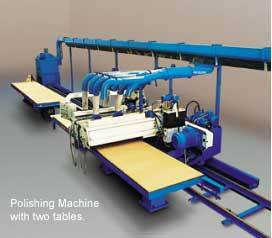 Polishing heads touch and move along on top of the aluminium extrusions which are laid on the fixed work-table. 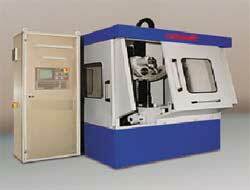 The polishing head presure and height can be adjusted from the control panel. 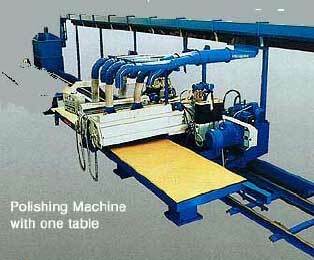 If the machine has two work-tables, then as the aluminium extrusions on the first table are being polished, you can load or unload the aluminium extrusions on the second work-table. 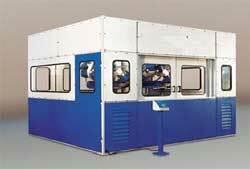 Therefore your productivity is increased because no loading / unloading time is wasted during polishing period. The polishing heads move to the other work-table as soon as it finishes the polishing period at the first work-table. Aluminium extruded profiles to be polished are laid over a moving work- table which maximum dimensions of 1000 mm W x8000 mm L. The table loaded with aluminium profiles moves under one or two polishing heads equipped with polishing/bright finishing buffs rotating at 1500 rpm. 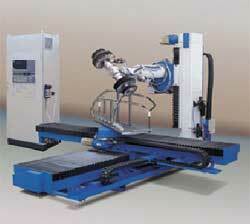 The polishing head presure and height can be adjusted from the control panel. Throughfeed abrasive belt grinding machines with 2, 3, 4 or 5 working heads for giving decorative grinded finish onto aluminium extrusions. 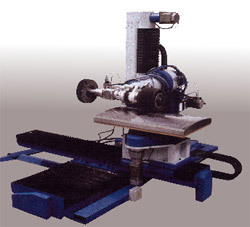 The grinding machine has a return conveyor belt and may have rotary discs at either end of the machine to work with parts on fixtures depending on the model and type. 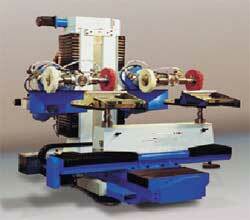 There is a liquid coolant system for abrasive belt grinding. Information and remarks on aluminium surface preparation designation system mentioned in the standards EN 12373-1:2001 and DIN 17611 and the QUALANOD Specifications.All treatments mentioned below are done before aluminum anodising (anodizing - anodic oxidation coatings on aluminium). E0 Degreased and deoxidized only Surface preparation before anodizing in which the surface is degreased and deoxidized without further pretreatment. Mechanical marks such as scoring and scratching will remain visible. Corrosion effects, which were hardly visible before treatment, can become visible af ter processing. E1 Grinded only Grinding produces a comparatively uniform but somewhat dull appearance. Any surface defects present are largely eliminated but, depending on the coarseness of the abrasive, grinding groove s may be visible. This effect may be used as a decorative choice as well. E2 Brushed only Mechanical brushing results in an uniform bright / somewhat dull surface with visible brush marks. Surface defects are only partially removed. This effect may be used as a decorative choice when performed with stainless steel wire brushes of different wire thickness. Smaller wire diameter more satin finish. E3 Polished only Mechanica! polishing results in a shiny, polished surface but surface defects are only partially removed. E4 Grinded and brushed Grinding and brushing gives an uniform bright surface with mechanical surface defects eliminated. Corrosion effects, which may become visible as a result of E0 or E6 treatments, are eliminated. E5 Grinded and polished Grinding and polishing gives a smooth, shiny appearance with mechanical surface defects eliminated. Corrosion effects, which may become visible as a result of E0 or E6 treatments, are eliminated. E6 Chemically etched Af ter degreasing, the surface is given a satin or matt finish by treatment in special alkaline etching solutions. Mechanical surface defects are smoothed out but not entirely eliminated. Any corrosion effects on the metal surface may become visible as a result of this treatment. Mechanical pretreatment before etching can eliminate these effects, but it is preferable to handle and store the metal correctly to avoid corrosion. E7 Chemically or electrochemically brightened After degreasing, the surface is treated in a vapour degreaser or non-etching electrochemically cleaner. Hence the surface is given a very bright finish by treatment with special chemical or electrochemical brightening processes. Surface defects are removed only to a limited extent and corrosion effects may become visible.